Ok all you adventurous machine embroidery ladies! It’s time to take our hobby to the next level!!! Yes! We are doing some Cut Work! Well, for some reason, looking at cut work reminds me of stained glass windows. But that’s really not what it is at all. 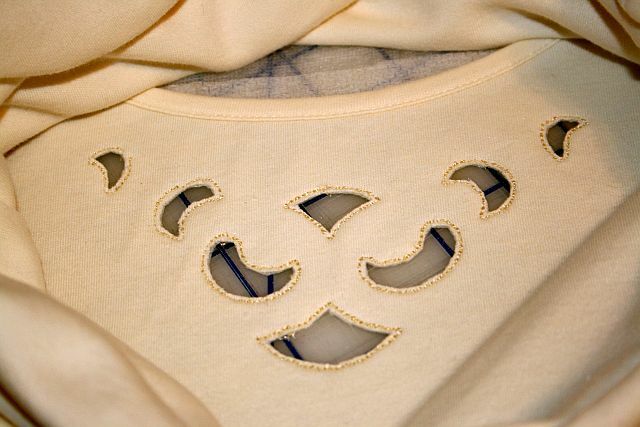 Cut work is embroidery on fabric that is literally CUT OUT during the embroidery process. So, your finished project has artistic and deliberate “holes” that are surrounded by beautiful embroidery stitches. 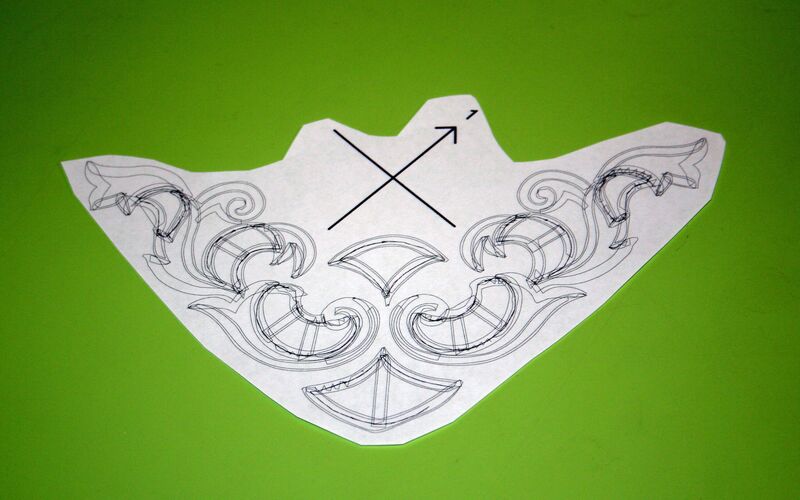 Here are some pictures of cut work designs by Anita Goodesign and also one by Dakota Collectibles. You can get these and other designs from Humble Sewing Center or order them online. 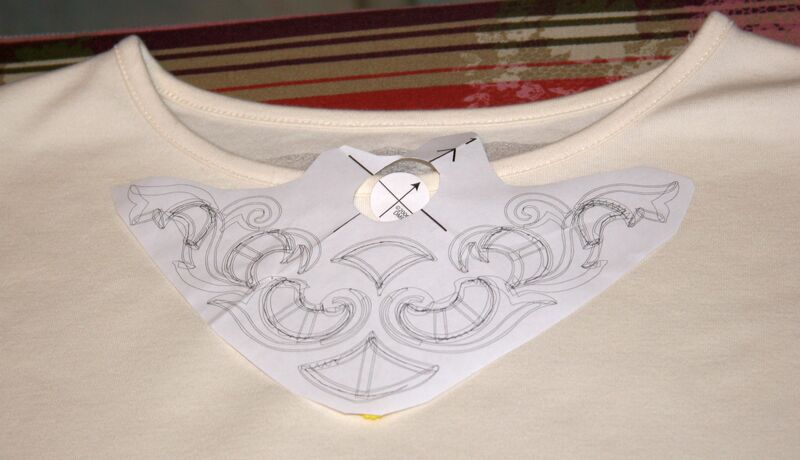 Check out the pictures and then take a look at my step-by-step adventure in Cut Work on a shirt…. 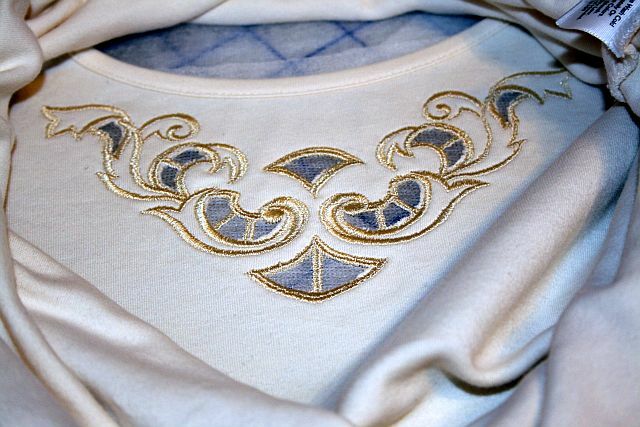 Step Two: If you have embroidery software, print out a design template to help you with design placement on your shirt. Don’t have software? If you aren’t ready to invest in a full blown digitizing software, I like to recommend 2 smaller software packages, depending on what machine you own. Step Three: Peel the paper backing off of the self-adhesive stabilizer and hoop it with the sticky side face up. Step Four: Place your design template on your shirt and mark the cross hairs with a sticker or pins to help you with hooping. Once you know where the design will be, you can fuse a piece of the No-Show fusible stabilizer to the wrong side of the shirt. 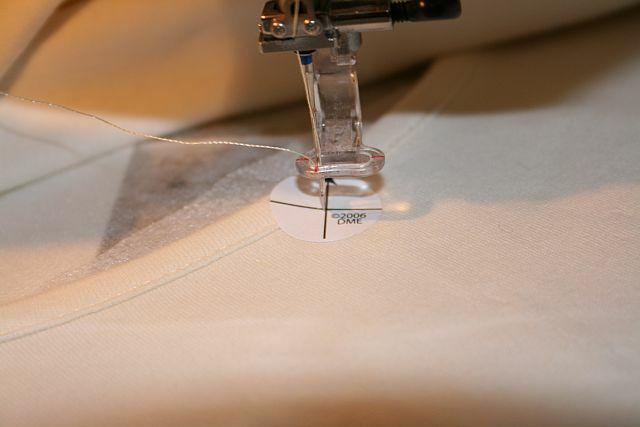 Make sure you are fusing this stabilizer in the area that the shirt will be embroidered. This stabilizer helps keep your stretchy shirt fabric from becoming distorted during hooping and embroidering. 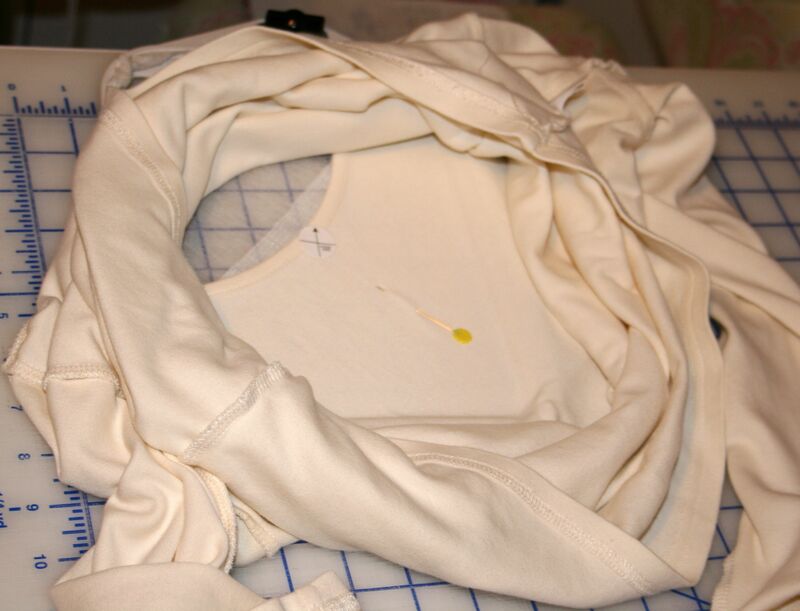 Step Six: Turn your shirt inside out and place it right side up on top of the hoop's sticky surface. I used the plastic grid that came with my hoop to help me align my shirt in the hoop. If my way is totally confusing you, see below to find out how Nancy Zieman does it. Step Seven: Once the shirt is hooped, make sure the needle is aligned with your target sticker or pins. Step Eight: Stitch the first step of your cut work design and remove the hoop from the machine. Do not un-hoop the shirt! Step Nine: Using your fine tipped embroidery scissors, cut out the fabric inside of the stitch outlines. Even cut through the stabilizers. 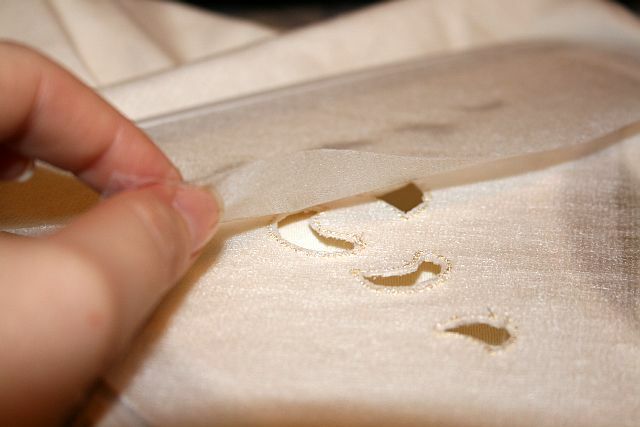 Step Ten: Turn the hoop over and use a piece of the self-adhesive stabilizer to patch the holes you cut. This is a very important step! Don't forget to patch those holes!!! Step Eleven: Place the hoop onto the machine and finish stitching out the embroidery design. Step Twelve: Remove the hoop from the machine and un-hoop your shirt. Trim away the excess stabilizers and use warm water to rinse away all of the wash away stabilizer. 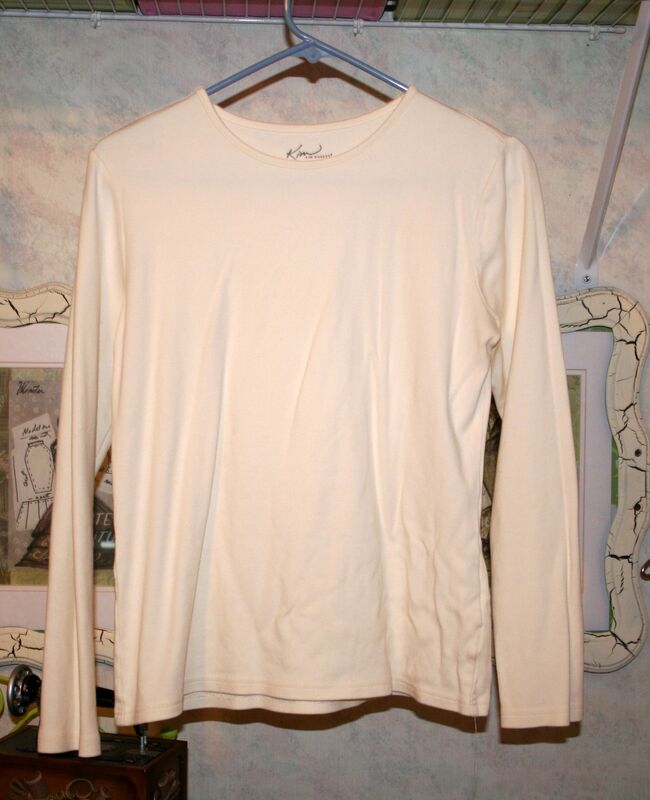 Tumble dry your wet shirt. 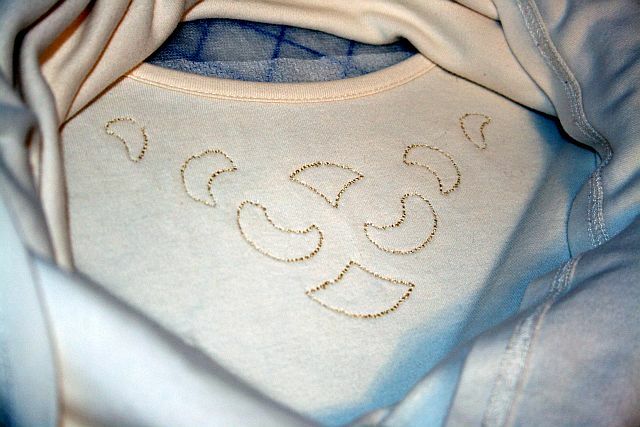 Note: If the embroidered area is stiff, you may need to rinse out the shirt again to remove the rest of the wash away stabilizer. 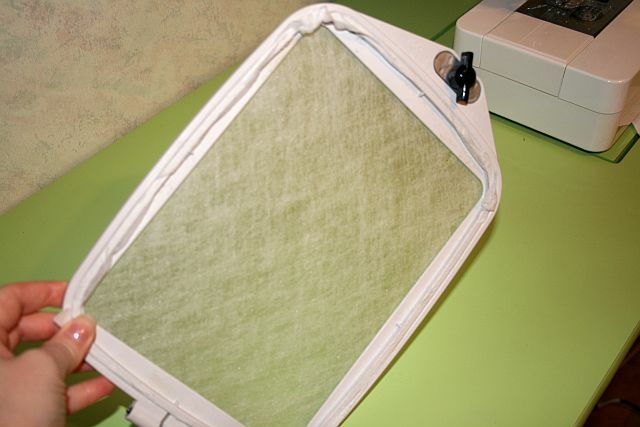 Once your shirt is dry, use a pressing cloth and press if necessary. Look at my new shirt! 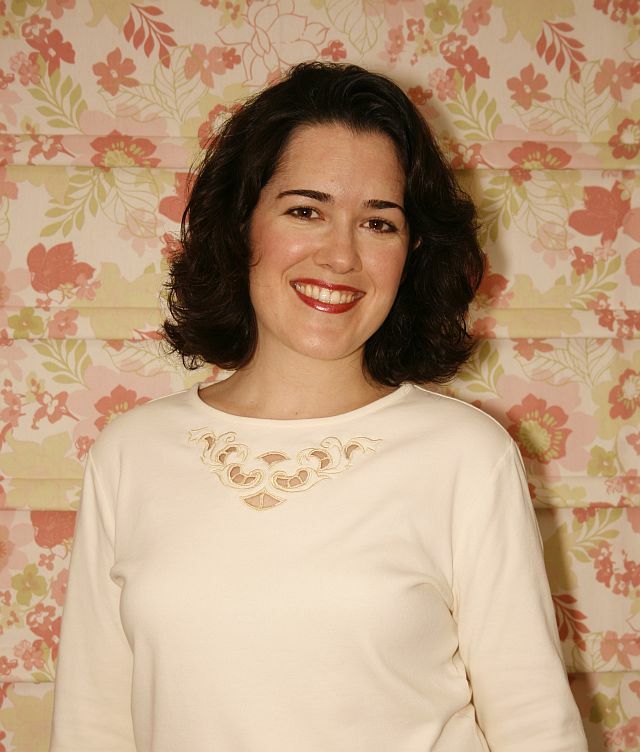 By the way, this design is from Anita Goodesign Butterfly Cut Work Collection. I Love it! My dog, Rilie, is very happy with the way my shirt turned out! She's giving me her high five! 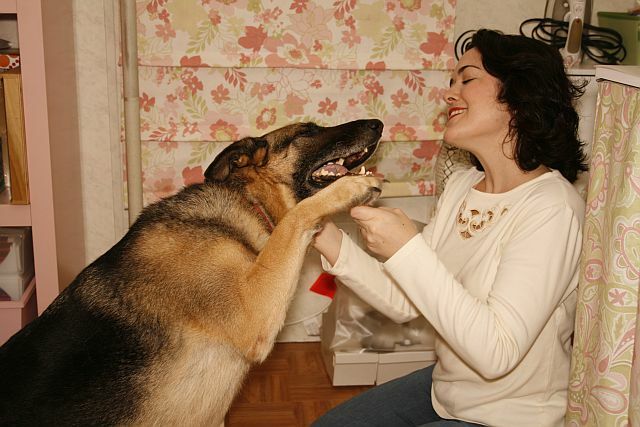 What a sweet girl! I hope this helps you with your first try at Cut Work! This entry was posted in Clothing, Machine Embroidery FYI, Project Tutorials, Tips/Techniques FYI and tagged embroidery on a t shirt, machine embroidery cut work on February 4, 2012 by Jenny Gabriel. Thank you for the great instructions ! I am going to try this soon ! Beautiful!!! 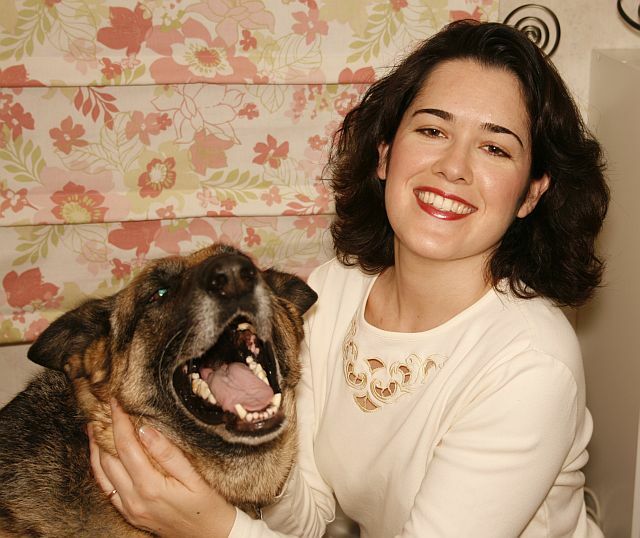 And cute dog shots too. I’m a sucker for those! Where did you get the cut work design? 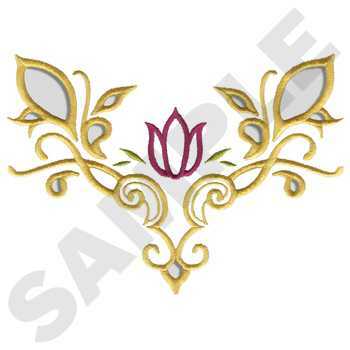 It is very pretty and I would like to buy it. Loved your beautiful cut work tutorial. Beautiful like you. So happy you can help those abused girls. It almost happened to me. Have you ever used the needles that cut the fabric in the hoop?